From sage, to leaf, and now to blackened, dark green kitchens are primed to trend. Warmer than gray, more interesting than white, and equipped with a quiet kind of glamor, dark green kitchens manage to look urbane yet organic. I was immediately taken by the original way this British racing green was used by Houston designer J. Randall Powers did in his own home [top]. Glossy inky green cabinets (a color you get by adding black) paired with a dark wood floor,plus an active white marble counters and backsplash, manages to evoke the traditional comfort of an English library. Moon yellow leather-upholstered Knoll Brno chairs and matching window covering adds a discreet accent color. Having a huge antique dining table in the heart of the kitchen makes it quintessentially social and homey, yet it is appliance-packed and clearly designed for active cooking. As with many traditional kitchens today, it’s modeled on the Victorian style with glass-front, double-tier upper cabinets used to showcase china and collectibles. Don’t miss the elegant “silver cabinet” upper cabinet (far left) with a contrasting red interior that shows off the plate. 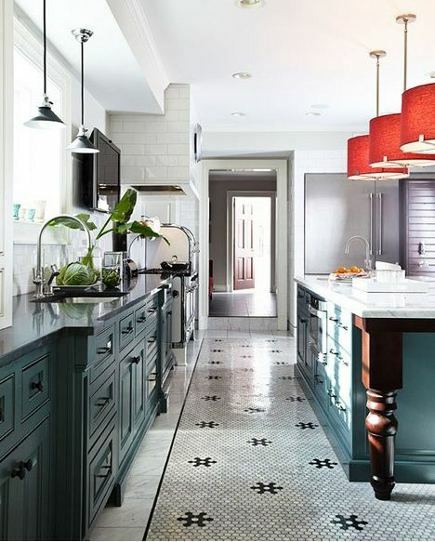 A similar green reads as nearly neutral in this Laura Casey kitchen. Because there are no upper cabinets, everything above the counters is white plus there is black and white pattern on the floor by way of 1930s bistro-style hex tile. (I love this floor!) Black perimeter counters and white marble on the island play off the tile. A dash of dark wood is mixed into the island via chunky legs (definitely optional in my mind). Then, as a device to pull the eye up from the floor pattern, nothing could be more effective than red barrel shades on the pendant lights over the island. And yet — like the cabinet interiors in the powers kitchen, above — you’d never think Christmas. I always think of this lovely tertiary green as Italian – don’t know why!